Has Kepler Discovered a New Class of Celestial Object? The first results from NASA’s Kepler exoplanet hunter are in and a perplexing early result has been announced. Yes, the space telescope is working fine, and no, it hasn’t spotted an alien homeworld (yet), but the Kepler team have uncovered something pretty cool. Kepler may have discovered a new class of celestial object (possibly). But before we start scratching our heads in confusion or popping the champagne corks in celebration, let’s try to work out what Kepler has observed. Kepler is currently monitoring 100,000 stars in an effort to seek out extra-solar planets (or “exoplanets”) orbiting these stars. Although Kepler was only launched in March 2009 and early doubts about the observatory’s capabilities caused some low-level concern, Kepler appears to be functioning well and mission controllers are already reporting early results. In sifting through the Kepler data taken so far, postdoctoral student Jason Rowe found a very curious light signature. When an object passed behind its central star, the light from the system dropped significantly. This means the object — called KOI 74b — must be glowing fiercely with its own light that was blocked out when the object was eclipsed. Hold up, the light dimmed when the exoplanet passed behind its parent star? Something’s not right here. Kepler detects exoplanets when the worlds pass in front of their parent stars, thereby dimming the starlight, not vice versa! Actually, this is exactly what’s happened. The “exoplanets” orbiting two otherwise ordinary stars appear to be brighter — and hotter — than their host stars. 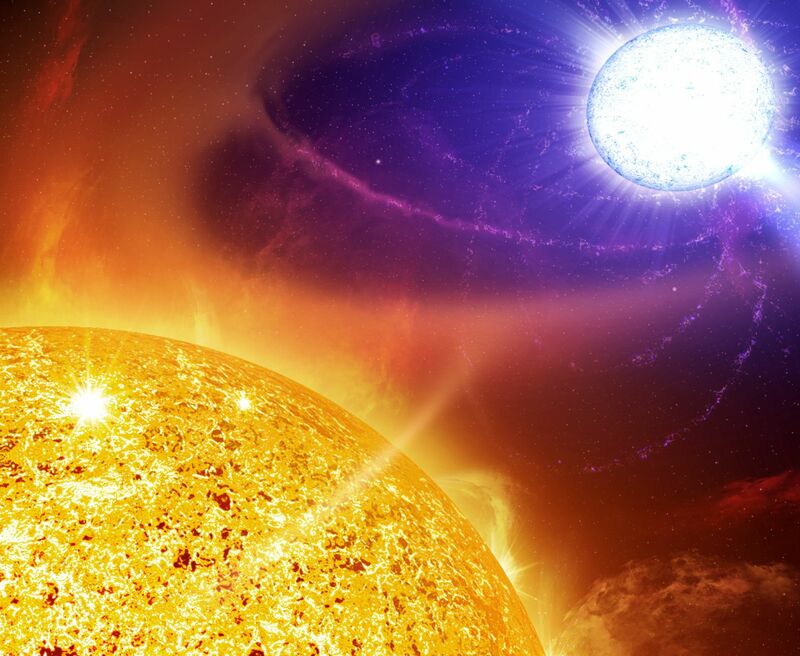 It’s as if the roles of the stars and the exoplanets have been reversed; the stars are dimming the exoplanetary light as the exoplanet passes behind the star. Needless to say, there is currently no stellar model that predicts this kind of behavior from extra-solar planetary systems. This means the object — called KOI 74b — must be glowing fiercely with its own light that was blocked out when the object was eclipsed […] It is seething at 70,000 degrees Fahrenheit while the parent star is 17,000 degrees Fahrenheit. The strange object can’t be a star because the transit data show that it is no bigger than Jupiter. —Ray Villard, Discovery News. One theory is that KOI 74b (and the other strange object, KOI 81b) could be a white dwarf star that migrated close to its stellar partner. Through binary interactions, the white dwarf was stripped of some of its mass, causing it to puff up and appear like a gas giant exoplanet. That would certainly go to some way of explaining why these two “exoplanets” are so hot. Of course, the other option is that Kepler has made a groundbreaking discovery and identified a whole new class of celestial object… but I suspect there are other, more mundane reasons for these observations. Isn't 17,000 degF (9400 degC) kind of cold for nuclear fusion? That's surface temperature. The core, where most fusion occurs, is much, much hotter. Re comments: unable to understand why all 'reactions' quote the above article. There are only 2 comments 5 months old, same as the age of the ' reactions.' comment 1 says temp too cool for fusion, comment 2 says only surface temp, inner hotter. Are we not aware the corona of the sun is enormously hotter than the interior? I have been at a European astronomy site which offers the info that Kepler may have discredited planetary formation theory. Something to think about & brings to mind the Milton-DeGrazie theory of soslar system formation. And the Milky Way has been disclosed to have 4 arms spiraling out, not two. Why no genuine info or interest? Re comments: unable to understand why all 'reactions' quote the above article. There are only 2 comments 5 months old, same as the age of the ' reactions. 'comment 1 says temp too cool for fusion, comment 2 says only surface temp, inner hotter.Are we not aware the corona of the sun is enormously hotter than the interior? I have been at a European astronomy site which offers the info that Kepler may have discredited planetary formation theory. Something to think about & brings to mind the Milton-DeGrazie theory of solar system formation. And the Milky Way has been disclosed to have 4 arms spiraling out, not two. Why no genuine info or interest? Thumbs up to Kemplar and NASA. What they are doing for mankind is admirable. I just hope they find something or someone. That would be awesome. Some conlusion: In sifting through the Kepler data taken so far, postdoctoral student Jason Rowe found a very curious light signature. When an object passed behind its central star, the light from the system dropped significantly. This means the object — called KOI 74b — must be glowing fiercely with its own light that was blocked out when the object was eclipsed. The light dimmed when the exoplanet passed behind its parent star? Something’s not right here. Kepler detects exoplanets when the worlds pass in front of their parent stars, thereby dimming the starlight, not vice versa! New quantum mechanical theory of opposing ant attractive standing wave theory to be applied here.Application of Bernoulli spin pressure that may be reversed according to the spin profile generating an increase in pressure or decrease in pressure as the case may be which is reversed in between two star emissions calls for new theories . led scientists to believe their rotation would be slowing down over time. considerably brighter than the star Sirius is today. also in hydrostatics dynamics between stream line to turbulent flow dynamics.